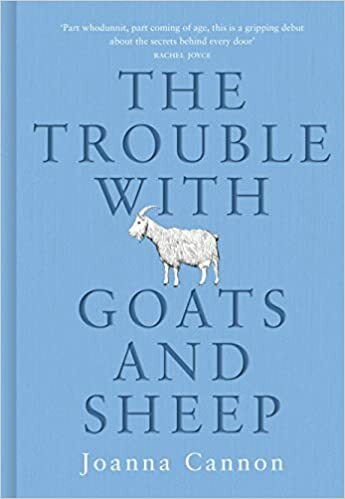 Set during the drought of 1976, The Trouble With Goats and Sheep begins with the disappearance of Mrs Creasy from her home on an East Midlands suburban street. Ten-year-old Grace, both confused and inspired by a rare visit to church, becomes convinced that if she and her friend Tilly are to find out what has happened to Mrs Creasy, they must first find God - so they set about looking for Him via the comically methodical method of simply going door to door. As you can probably tell, this isn't really a whodunnit so much as a gradual revealing of secrets, some large and some small. It's about the secrets that adults keep from children, that children keep from their friends, and that neighbours keep behind closed doors. It's sometimes dark and sometimes very funny, but mostly it's somewhere in between, particularly when we see things from Grace's perspective. Grace is a perfectly realised character with the perfect mix of precociousness and naivety. She and Tilly frequently get things wildly wrong, and yet at the same time, their observations are often unwittingly perceptive. The portrayal of their friendship - as intense and occasionally volatile as any relationship between ten-year-olds is bound to be, yet somehow cemented by the fact that they are apparently bullied by everyone else - is deeply touching. The adult characters are also extremely well-observed, with all their failings and prejudices. There are no real heroes and villains - or sheep and goats - whatever it might seem at first glance, and the more we see what goes on behind each pair of net curtains, the more we come to realise that everyone has something to hide as Joanna Cannon builds a detailed portrait of a street hiding countless small but deeply human tragedies. By setting the book in a single street, and against the backdrop of a famously oppressive, relentless heatwave, Cannon also beautifully conveys the claustrophobia of the situation. That doesn't, however, stop the book from being laugh-out-loud funny at times - a surprising vision in creosote and Grace's parents' reaction to the arrival of the street's first Asian family, in particular, make for some of this novel's most entertaining moments. I thoroughly enjoyed this novel. It's a perceptive, evocative and perfectly observed portrait of 70s suburban life that I would certainly recommend.